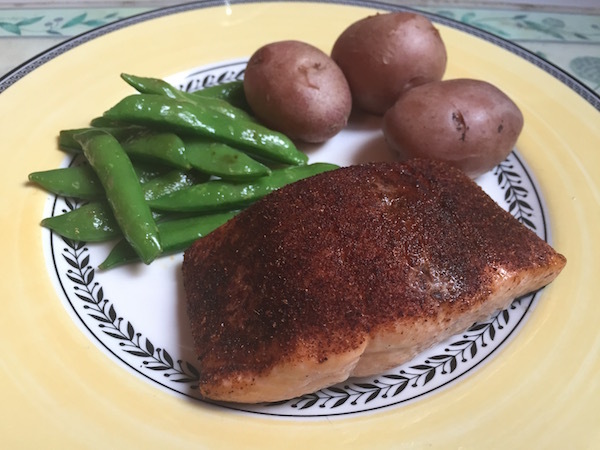 Cooking with Amy: A Food Blog: Chile Rubbed King Salmon Recipe & GIVEAWAY! Chile Rubbed King Salmon Recipe & GIVEAWAY! It's King salmon season and I couldn't be happier. 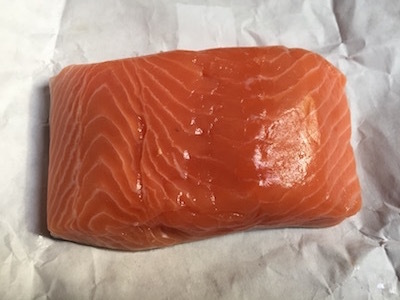 King, also known as Chinook is the most precious and luscious salmon around. It’s very high in healthy fats and has an amazingly creamy texture. I was offered the opportunity to try fish from Daily Fresh Fish so naturally I chose King salmon. DailyFreshFish is a company that delivers seafood overnight. There's no warehousing or middle man and no time for it to linger in a case at the market. It goes from the dock to the shore and then directly to you. The only way to get fresher seafood would be to either catch it yourself or go to dock and get it from a fisherman. The company offers a wide range of seafood, and is certified with The Marine Stewardship Council (MSC) sustainable seafood certification program, which verifies that the seafood is sustainable. They also use seafood guides from the Seafood Watch from the Monterey Bay Aquarium and the NOAA FishWatch to select sustainable fisheries and farms. Even their shipping materials are made from recyclable materials or are reusable or recyclable. For years I have experimented with different techniques for cooking fish. I particularly love Jacques Pepin’s technique of cooking fish at 200 degrees. I use the same technique but start the fish in a skillet over high heat because I love eating crisp salmon skin. I also add a spice rub because it gives the fish plenty of flavor and color without drowning it in sauce. This recipe uses a spice rub I created for a client years ago. Taste it before you put it on the fish and adjust it to your liking. It can easily be made in smaller or larger amounts depending upon how much fish you have. Thanks to DailyFreshFish I’m giving away 2 packages of 2 six ounce filets of fresh King salmon (value $28.99). You must be a US resident to win. Leave me a comment telling me about your favorite seafood meal or fishing experience. Two winners will be chosen on August 25th. Be sure to enter your email address in the field where it is requested. Do not leave your email address in the body of the comment. Note: King salmon should be available all month, but in case it’s not you will receive frozen King salmon instead. Preheat oven to 200 degrees. Combine the chile powder, cumin, brown sugar and salt in a small bowl. Coat the flesh side of the fish with the spice mixture. Heat a cast iron or oven proof skillet over high heat. Add enough oil to barely coat the skillet. Carefully lay the salmon into the skillet, skin side down. Cook for 2 minutes or until the skin gets crisp. Transfer the skillet to the oven and bake for 20 - 30 minutes, or until cooked until done to your liking. The amount of time will depend upon the thickness of your filet. Disclaimer: DailyFreshFish supplied fish to me an for the giveaway. I was not compensated monetarily for this or any other post.